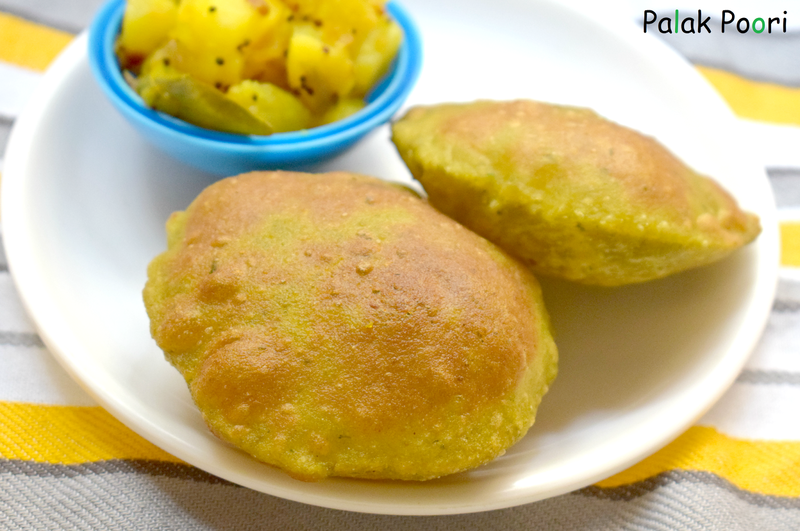 We have already seen a recipe for Poori bhaji, there is slight difference in this recipe. Adding spinach will make it more healthier. Ususally poori is prepared with the combination of wheat flour and multi purpose flour. But I have used multi grain flour here and that's why you can see the color difference.. You can use wheat flour alone. I had to blanch palak before using. 1. Clean the spinach, wash it thoroughly. In a pan, boil the spinach in enough water for 1 or 2 mins. Put the spinach into strainer, drain all the water and let cold water run over the boiled spinach. This process softens the spinach and enhances its color. 2. In a grinder add all the ingredients mentioned in to grind section. Add garlic cloves, green chili, coriander, ajwain, ginger and the blanched spinach. Give a pulse. 3. In a mixing bowl, add the palak ground paste and salt. Add the flour little at a time. Keep mixing the ingredients. Add the flour how much ever needed, add oil and knead this to soft dough like chapati dough. Let this rest for 5 mins. 4. Divide the dough into small lemon sized balls. apply oil and spread each one of them to small rounds which should be evenly thick on all the sides. 5. Heat oil in a heavy bottomed pan, to check if the oil is heated drop a small ball of dough in oil and see if it rises to the top then you can say the oil is sufficiently heated to fry the puris. Otherwise wait for some more time. 6. Add the spread dough one by one into frying pan and press it with slotted ladle so that it gets immersed in oil. Fry the puris on both the sides, drain excess oil and spread it on tissue paper so that the excess oil gets absorbed. 7. Serve this hot with ketch up / Potato sabzi. 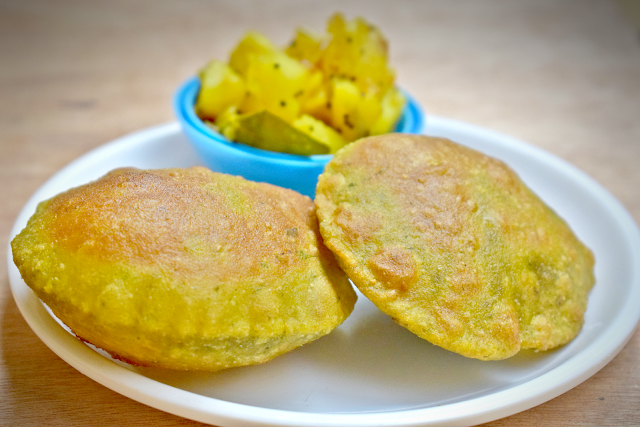 You can check Recipe for Poori and Potato sabzi here.